I have read in numerous places recently about how the profession of economics has failed to deliver real benefits because the mainstream theory is built on the wrong assumptions. I and I’m sure you also have experienced the downside of this but these pieces until now have only been able to point out the problem not the solution which would be a new model of the economy and what it would teach us to do differently. Well now we have a better model and what needs to be done to move forward with the economy, the country and our personal searches for financial well-being. Oh and by the way how to fix our domestic political issues and preserve our position in the world order. The Book is Called “American Gridlock: Why the Right and Left Are Both Wrong – Commonsense 101 Solutions to the Economic Crises” and you can find it in our ‘On Our eReaders Now’ section in the far right column of this page. 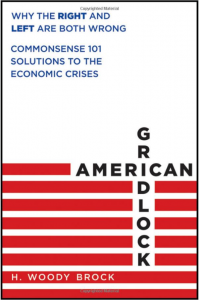 Clicking on the book there will take you directly to the American Gridlock page on Amazon. 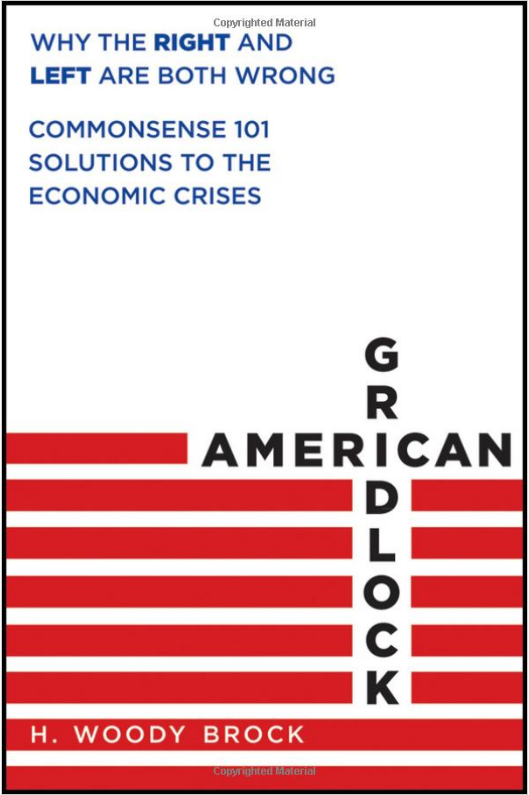 For a sneak peak at the book check out John Mauldin’s Outside The Box post called ‘American Gridlock, Part 2’. John is well connected to a wide range of worldly and deep thinkers who are kind enough to share their thoughts on his blog. Mostly around finance and the economy but inescapably bringing politics and world affairs as they intersect with the first two. And as Woody Brock says in American Gridlock political theory and political science should be more on our minds than economic theory or finance. Ironically while Woody’s consulting clients typically make up the top 1% of the 1% he is one of the leading thinkers on distributive justice! With good reason of course and with his witty style you will enjoy his goring of the ‘other side’s’ ox … at least until it’s our turn for a run down the street in Pamplona 😉 Not to worry, his main points demonstrate that with new theories in place the old divisions melt away when it comes to solutions. About the author from Amazon’s Page: Dr. Horace “Woody” Brock, one of the world’s foremost economists, is the author of the new book, American Gridlock – Why the Right and Left Are Both Wrong, Commonsense 101 Solutions to the Economic Crises. More than 50 leading chief executives, academics, journalists and investors endorsed the book, published in January 2012 by John Wiley & Sons, Inc. As the founder and president of Strategic Economic Decisions, a renowned economic think tank, Dr. Brock has spent more than 25 years counseling global corporations and other institutions who benefit from his in-depth analysis of ongoing structural changes in the global economy. Previous Previous post: Canadian office, industrial and retail Real Etate on fire too. Not just multifamily. Next Next post: Where is your apartment market in the cycle? Latest Multifamily Market Cycle Charts now posted via Glenn Mueller, PhD.